Everyone knows what it’s like to have a headache. But contrary to what many believe, migraines are not just intense headaches. A migraine is a group of neurological symptoms and head pain is only one of them. As any sufferer of these sometimes debilitating symptoms knows, a migraine can cause dizziness, vision changes, vomiting, and extreme light sensitivity. If your migraines are accompanied by light sensitivity, you can help your condition by paying attention to which type of desk lamp you use. 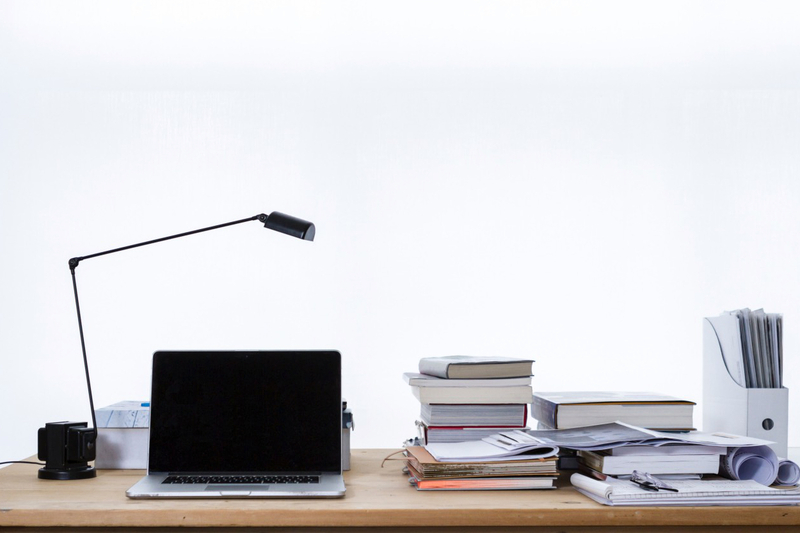 Which desk lamp factors should a migraine sufferer look for, and why? To reduce the risk or intensity of migraines, look for a desk lamp with easy-to-control brightness levels. The lamp should ideally have at least a few different settings to choose from. Another factor that makes a light suitable for people with migraine symptoms is a design that makes the lamp adjustable. A movable stand or flexible arm will help you maneuver the light source farther or closer as needed to minimize sensitivity. You may even choose a clamp-on light that can be easily moved. During a migraine attack, even going into a grocery store can be a struggle because of the bright flickering lights. Which type of bulb should you use at your desk to minimize this discomfort? Certain types of lighting are more likely to cause sensitivity and pain than others if you suffer from migraines. LED bulbs are energy-efficient and don’t have the flickering issue that can be hard to bear. In addition, they burn brightly and last longer than other types of bulbs. Incandescent bulbs offer a traditional warm glow and won’t flicker like fluorescent lights. Since incandescent lights are not as energy-efficient as other bulbs, they aren’t as common now. But if you have migraines and light sensitivity, it could be worth switching back to this more tolerable type of lighting. One thing to note, incandescent bulbs are being phased out by many manufacturers, so it may become more difficult to find them in the future. In the past, compact fluorescent bulbs (CFLs) have gotten a bad rap, but newer designs are much improved. Older designs that are typically used in industrial, institutional, and commercial office settings had a noticeable flicker rate. Newer designs refresh at a much higher rate and are less likely to cause issues. Fluorescent bulbs also typically have a color temperature more on the blue end of the spectrum. The blue light component can also contribute to migraines in some people. Overall, Experts are divided on the connection between CFL’s and migraines. That being said, if you are particularly sensitive, it will be best to avoid CFL’s in favor of other types. Here are some top options for the best lighting to avoid migraines. If you like the idea of being able to switch between yellow and white lighting, this Amico 11W LED lamp is a good choice. 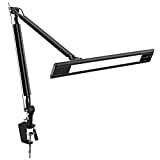 It’s a clamp lamp that you can attach to the side of any table or desk and comes with a metal swinging arm for adjustability. Complete with four dimming options and four lighting modes, this product has a memory function and remembers your preferences. The lamp head can be adjusted right and left 360 degrees, as well as up and down 180 degrees. And the base also rotates. In addition to the variety of dimness settings, you can also choose between four color modes. If you have extreme light sensitivity, you will likely find relief in the 20 different lighting options. The warm natural light setting on this lamp is similar to an incandescent lamp, minimizing eye strain and migraine pain. This light is crafted with great quality, but note that the controls can be hard to see as there aren’t tactile indicators. For those who have energy-efficiency as a top concern, this USB-charging Newhouse Lighting LED lamp offers non-flickering and natural lighting for minimizing pain and sensitivity. The touch-dimming light has a flexible gooseneck design and makes it easy to twist and adjust the lamp. It can be used as accent lighting, or you can point the light upward or downward, depending on your needs. The lamp looks stylish and the soft-touch button is easy to feel for without looking. The light is a 3-Watts LED and has a 300-lumen output, along with 3000K color temperature output. If your work includes checking your smart device often, charge your phone or tablet while you work in the included 2.1A charging port. This lamp is very stable due to the well-weighted base, so you don’t have to worry about it tipping over, even when the neck is completely straight. Note that this light isn’t a touch lamp that turns on or off just by tapping it anywhere. In order to use the lamp, you need to touch the designated switch. One other thing to be aware of is that the bulb is not replaceable. It’s rated lifetime 22.8 years at 3 hours per day usage, so this should not be a problem for most users. If you’re looking for a desk lamp that can double as a bedside table light, the Normande Lighting GP3-796 could be worth considering. It’s 18 inches tall, has a weighted, sturdy base, and has two power outlets at the bottom for convenient smartphone charging. There is a simple, easy-to-use rotary switch for turning the light on and off. This light is ideal for migraine sufferers as it casts a pleasant, mellow light and doesn’t flicker. When the lamp is off, the shade has a gray color. When you turn it on, it casts a nice amber glow. Assembly is straightforward and quick and the gooseneck design allows you to point the light source whichever direction is easiest on your eyes. This product comes with a shade made of double-layer plastic and the base has a brushed steel look to it. The lamp takes a single, Energy Star 13W CFL bulb (included), which will last longer than conventional light bulbs. Note that it’s important to use the right type of bulb in this lamp so that the shade doesn’t get too hot. If you prefer a classic design, this Catalina Amber Lamp could suit your tastes. It has an ivory linen shade, casting ambient lighting that won’t strain or hurt your eyes. 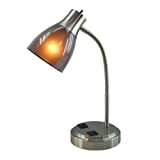 The lamp has a self-binding trim around the shade, a nickel base, and glass-finish body with an amber color. Choose between three settings (low, medium, or high) depending on the time of day and your specific needs. This light can be used in the office or at home and won’t clash with your décor due to its simple and elegant design. The lamp comes with a limited, single-year warranty for defects in workmanship or materials. The lamp base is heavy, well-made, and won’t easily budge (a huge plus for those with kids or dogs). Although this light is one of the costlier options on our list, you get what you pay for in quality and can expect it to last a long time. If simplicity and affordability are your top concerns, this next item should be perfect for your workspace. Unassuming and basic, the LEDU Adjustable Organizer light is easy to use and has a migraine-friendly source of light. 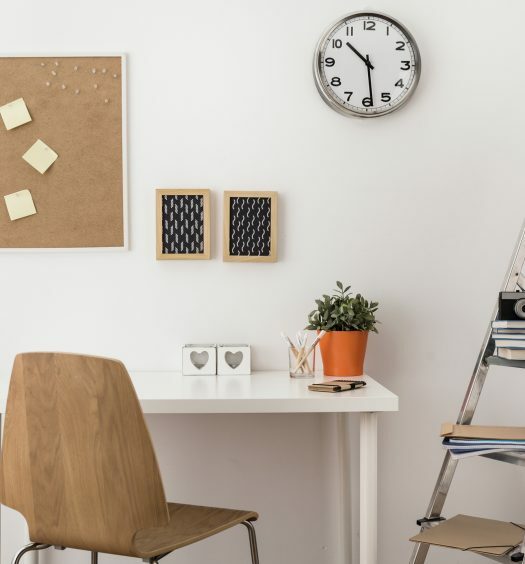 Keeping your desk organized can be a struggle. If you’re seeking both easier-on-the-eyes lighting and extra compartments for your desk, this offers both. 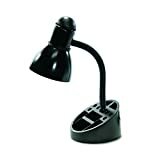 The lamp base comes with sections for paper clips, pens, and notes, while the adjustable neck gives you options for where to point the compact bulb. This product comes with a 13-Watt fluorescent light but can take bulbs up to 60 Watts. The on/off switch is oversized, making it easy to find for the vision-impaired. This light can be used as a bedside lamp or at your work desk and comes with a sleek, simple design that will fit any room. As an added bonus, this lamp is highly affordable, but note that it only comes in black. 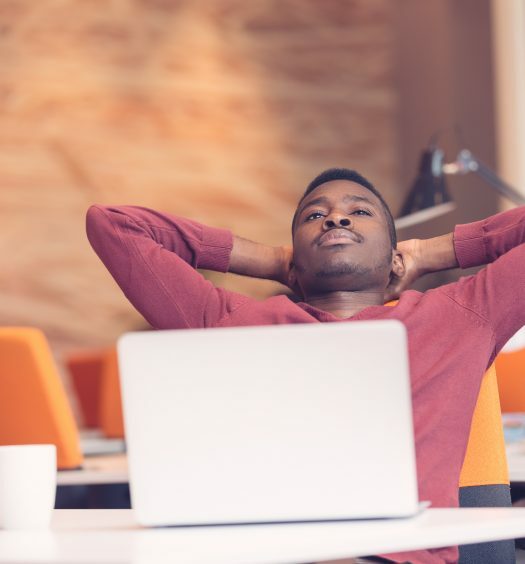 What if you occasionally work in an office or other location with overhead fluorescent lighting? There is a solution which may help: fluorescent light filters. The filter is a thin sheet which attaches over a typical 2×4 overhead fluorescent light and helps reduce the harshness and flickering. It essentially acts as a diffuser, providing a more natural lighting environment. One product to consider is the GlareShade Fluorescent Light Diffuser Covers (from Amazon). The great thing about this diffuser is it uses magnets to attach to the light frame, so installation is easy. You can even take it with you if say, you only work in the office occasionally. Even if you don’t frequently suffer migraines, diffuser covers for fluorescent lights can help reduce eyestrain and fatigue, especially when working on computers. Speaking of eyestrain, another option is light filtering glasses. These glasses have special lenses that filter out light of a certain wavelenght which is thought to trigger migraines. Sleeping too much or not enough can worsen migraine symptoms. Try your best to go to bed and wake up at consistent times each day, even during weekends. Stress is one of the most common triggers for headaches, which relaxation can help with. Look into meditation, yoga, or even talk therapy to treat this potential contributor to your symptoms. Make sure your office is set up for maximum productivity and are using a quality desk chair. Coffee-lovers won’t like this next suggestion, but cutting out caffeine can help immensely with reducing migraine symptoms. Caffeine withdrawal is the sole cause of headaches in some people, even though coffee may help initially. Keep this in mind and try switching to green tea, then getting rid of caffeine altogether. Of course, before taking any supplements, always consult your doctor. But magnesium deficiency is possibly a contributor to migraine headaches in many people. Try introducing each of these changes on its own and make sure you take detailed notes about how your migraine headaches are affected. Nervous systems are sensitive, and we’ll never know what triggers ours until taking the time to make some changes. I wish you the best of luck with treating your migraines and hope this article helped.